iPod Shuffle issues: the main one being that we hear too much about it. But sometimes it can't be helped. If Enjoy Uncertainty is something more than a marketing slogan to you, then you're probably not too keen on iPod Shuffle's DRM restrictions. And maybe, like me, you're not very happy about the prospect of throwing your flash player away, when the battery dies in a year's time. It's true, Life is Random, but good design shouldn't be. SanDisk, the favorite memory card maker of every photographer I know (yours truly included) has recently released a trio of flash players that should have the iPod Shuffle shuffling on down the block. Weight: 1.4 oz w/ battery. And, of course, you can use these as mass storage devices, too. If you (the photographer) are out in the field and find yourself running short on memory, you can dump the tunes and upload some images to the device. So here we have a device that is elegant and simple to operate, like the iPod Shuffle, yet far more fully featured and lower in price. Remember when you were a kid and you wanted something that was really cool, you thought, but your dad made you buy something practical instead? In this case, anyway, your dad is right. And that may be the coolest thing of all. The image is swiped, as you may have noticed, from B&H Photo (they also sell audio), along with the pricing. 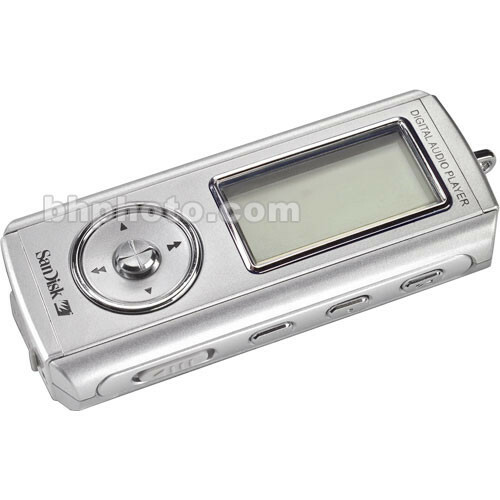 Their MP3 players, including the one above, can be found here. I have no connection with B&H, other than as a long term customer. I always buy my photo gear from them, and they do a great job. DISCLAIMER (1/27/05): I found this device, and reached these (obvious) conclusions, all on my own - only to find, much to my chagrin, that Dave Ciccone, at Dave's iPaq, had done exactly the same thing . . . only, two days earlier. Grrrr . . . .